A hitch step is a handy little towing accessory that makes it easier for you to get access to your sports utility vehicle or your truck bed and even your minivan rooftop. This thing can easily increase the versatility of your vehicle. They basically come in a variety of shapes, colors, and materials. Nevertheless, they all have one basic premise in common. 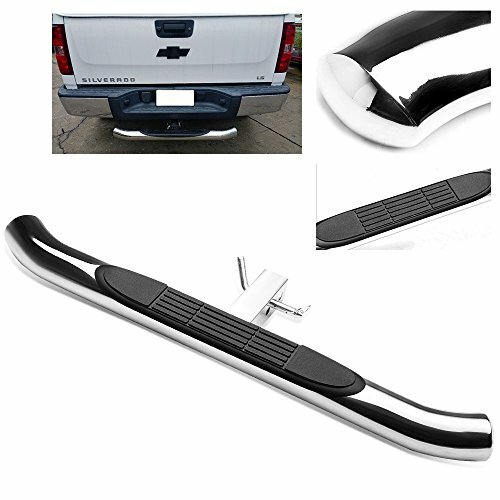 A hitch step slides into your vehicle’s receiver hitch, on which people can step. It boots you about 4 to 8 inches off the ground. This equipment is very nifty for you have the options to remove the step out and store it in the back or opt for leaving the step in place. 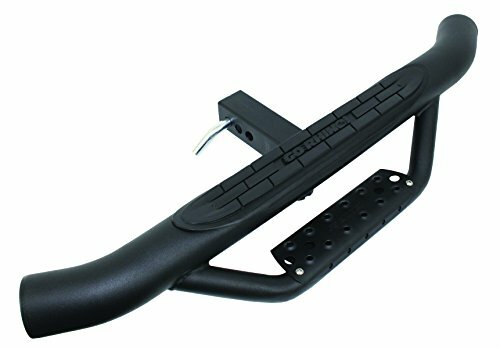 Today, some people use it as a “bumper guard” in that they leave the hitch step in place to protect the vehicle’s backside from damage in minor collisions. Read our brief overview below to learn more about some specific models available on the market right now. Since hitch steps are available in many shapes and materials, look at some of the highly recommended brands below to avoid feeling overwhelmed by the abundant choices. This item is patented with Hitch Armor that provides customers easy access to storage area. Moreover, it also has dual girder system in that users are also provided with optimum protection from rear-end collisions. That’s one upside of this kind of stuff that most people hope to get when purchasing a hitch step. 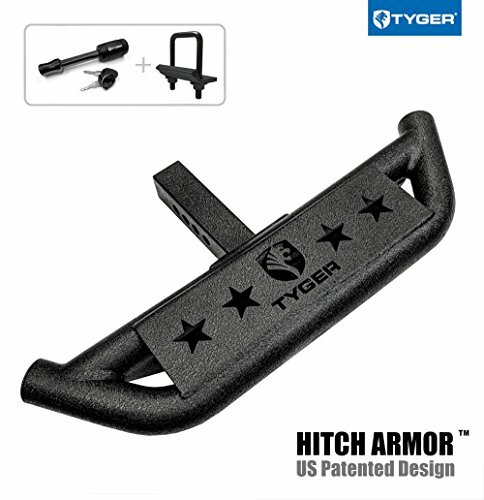 Note that, the Tyger Auto TG-HS8U81238 only fits on a two-inch hitch receiver. 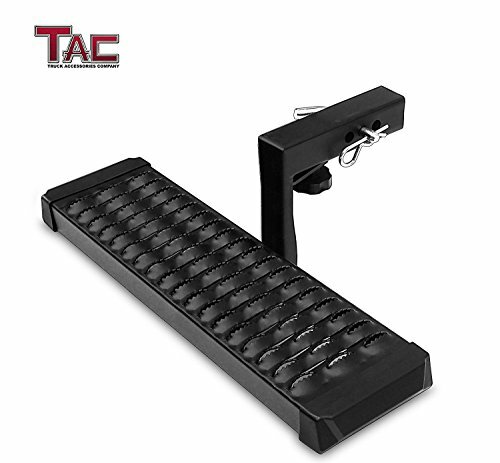 If you are also into the design, you’ll love the fact that this heavy-duty hitch step has 2” diameter and 0.120” wall thickness tubes and is textured in attractive black finishes. One will never have to deal with so much trouble installing it for the manufacturer has designed it to be an “easy plug” towing accessory in terms of installation. The package also includes free stabilizer and free pin lock. To top it off, TYGER also offers a no-hassle five-year warranty against manufacturing defects! If you are into cars and stuff, you would know that the Go Rhino has enjoyed its status as a leader in the automotive industry since 1975. They have pride in offering products to optimize owners’ vehicles. The Go Rhino D360T Dominator is a perfect example. Crafted from heavy-duty three-inch steel tubing, it provides a particularly wide standing spot. It has striking tiered two-step design that provides a significant access improvement to the cargo hauling areas of large vehicles like pickup trucks, trailers or SUVs. Some notable features include a non-slip rubberized step pad is a nice extra item that you can get to achieve a surer footing, an anti-rattle bracket accessory and three adjustable extension positions along the hitch shaft. Moreover, your vehicle is protected against molded bumpers as well! Just like Tyger Auto, this one also offers you a five-year warranty for optimum customer satisfaction. If you are looking for a hitch step that is pet-friendly then take a look at one manufactured by Heininger. This innovative pet stair step is an instant step that is multifunctional that provides easier access for your dog to get in and out of your pickup or SUV without any trouble. The step is attached to the hitch receiver of your truck. When it is not in use, you can store it under the bumper. This is the ideal step that should be seriously considered for if you have a pet that you love to bring anywhere with you for a ride. Constant jumping out of and into the vehicle can cause health conditions to your dogs such as leg injuries, arthritis, and other spinal damages. Another great thing about Heininger 3602 is it’s designed for one hand use so you don’t have to let go of the leash in your hand while positioning the step into place. It’s meant to last for a long time too (all-weather durability)! This step is suitable for any kind of two-inch hitch receiver and it fits especially well for trucks. There are two different height step that you can pick. When talking about convenience, this item is very handy in terms of catch the cargo in the truck box and you don’t even need to open the box door for that. With massive 7.3 inches in width and 26 inches in length, you’ll get wide step area. 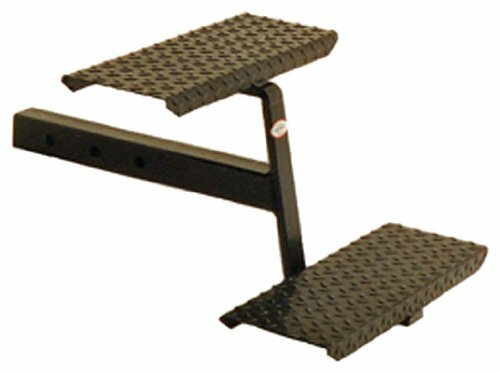 It’s a solid drop area with non-skid footing to access your truck bed, camper or roof rack. The product is made from aircraft grade aluminum and is beautifully constructed with mold form to provide even stronger support. the black finish texture this step has is meant for anti-crash. Last but not least, this step also comes with double layer protection thanks to the powder and coating and e-coating. There are three holes options available and the package already includes the lock pin. 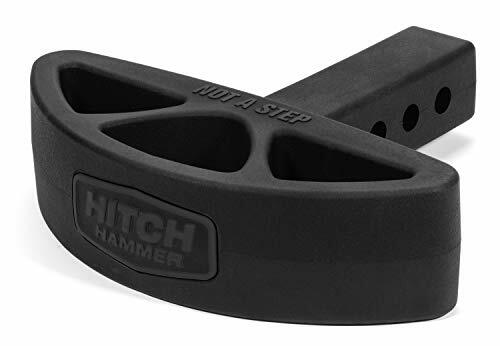 If you are looking for a hitch step that fits your particular 1 ¼ inch and 2-inch receiver then this is the answer for you. This item requires you to use a 5/8 inch hitch pin during installation. The hitch pins are actually easy and quick to use for flexibility to adjust the width and height to accommodate any payload size. The step bar diameter is about 3” and it’s made from polyethylene pad that’s guaranteed to be non-slippery. It’s made from high-quality stainless steel for longevity and reliability. Moreover, the coating is corrosion resistant. It’s able to impressively carry up to 350 pounds thanks to its solid all-welded design and construction. It goes so well with the sidebars as well in case you already have those. The step is designed to withstand any kind of road abuse as well as heavy duty towing purposes to its specified capacities. To save you from running an errand to the local store, the package already includes hardware that you need for installation. Another hitch step that is pet-friendly comes from Otto Step manufacturer. Your dog is protected from possible strain or jumping injuries with this step from Otto Step. The item fits into a two inch Class III or IV vehicle receiver. The upside of having this step is that you don’t even need to use a hitch pin to hold it in place. If your dog weighs up to 200 pounds, it can enter the vehicle’s rear cargo hatch area or pickup truck bed by stepping onto an additional step. That way, the chance of joint injuries can be minimized for your dog does not have to complete the whole distance at once. The step is paw friendly. It features an 18-inch x 16-inch high traction platform surface that is portable and lightweight. Another great thing about this step is that the size is really compact for vehicle storage. It’s a handy little thing that can be stored easily and used whenever it’s needed. This is a two-step hitch stair that is meant for many uses in order to offer convenience. You can use this step as an economical stair for camper entry too. There are three adjustable lengths featured, i.e. ½ inch, 3 ½ inches and 6 ½ inches (this is only true if it’s measured back of top step to hitch pin holes). The stair can hold up to 250 lbs. Upon purchase, you can immediately use it as no assembly whatsoever is required to get it to function. The item is attractively powder coated in a black finish to prevent from rusting. Just like the how high-quality hitch step should be, this one is also specifically designed to withstand road abuse within definite capacities. It’s wear resistance and delivers exceptional durability which should come as no surprise as it is basically built to ensure the finest level of value and quality in the first place. 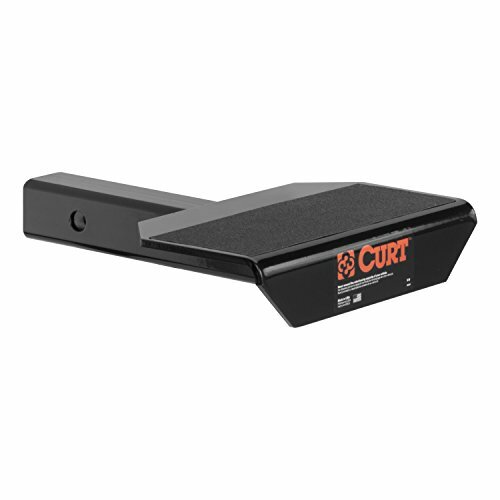 We would also like to recommend a model by Curt Manufacturing. This front mount accessory from CURT is a unique towing accessory that provides you with the possibilities that you don’t even realize even exist. 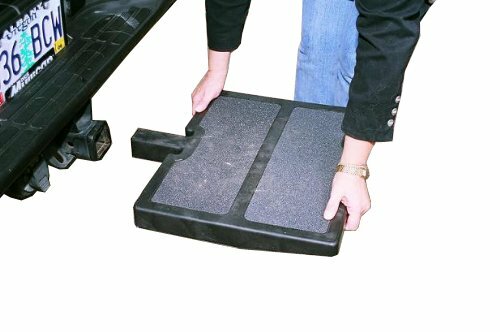 This is a step pad that is an anti-skid surface, providing you with a step up when working under the hood of your SUV or truck or even when climbing into the back of the truck bed. It can be mounted on the front and the rear of your vehicle. Doesn’t matter where it is mounted, it always delivers solid footing that can be installed and removed quickly as necessary. It has a generous platform surface measuring 6 3/8 inches x 10 ¾ inches. Add to that the flat design is complemented by the perfect size that makes it really stress-free to store in your vehicle when it is not in use. The step pad easily fits any kind of 2 x 2-inch receiver tube opening. 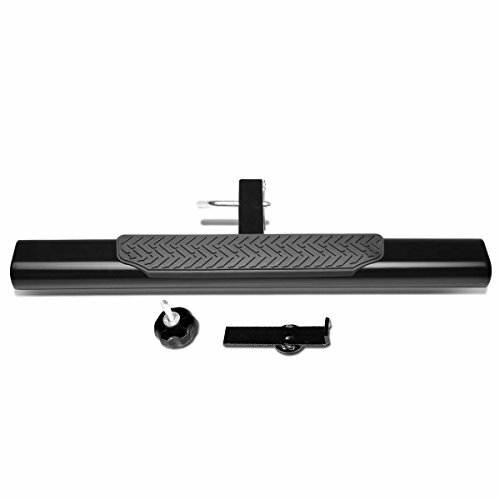 When you buy a Bully BBS-1104L LED hitch step, you are actually getting your hands on a hitch step that also can serve as a hitch cover and a bumper guard as well. This step is designed to fit any standard 2 and 1 ¼ inch hitch mounts. The accessory is made from heavy gauge stainless steel with a non-skid, high impact step pad. The lighted hitch cover provides you with easy access to your roof rack, truck bed or the rear cargo area of an SUV once it is secured. There is an LED brake light featured in this item so you can provide visibility for other drivers. Moreover, it is a formidable protection should something sneak up on the rear of your bumper. As a matter of fact, this is actually one of the most popular hitch cover accessory for Jeep Renegade, Jeep Wrangler trailers. You will need a professional installer to help you set this thing up as installation instruction is not included in the package. Are you looking for the ultimate hitch mounted bumper guard? Then consider this model by HitchHammer. This accessory flexes on impact to cushion parking related misfortunes that may ding, dent or scratch your precious truck or SUV. The item is made from 4.25 lbs of heavy duty flexible material. It’s able to withstand any kind of weather, even in freezing temperature the bumper guard will still stay surprisingly flexible. It will compress on impact and return back to its original shape in no time. Speaking of durability, this one is made to last with its military tough sandblasted surface texture. Unlike metal products, this one will never rust or bend out of shape. It won’t even crack like plastic products. What more do you possibly need? It’s been tested to save the bumper of a vehicle from damage; a 5,000 pound Range Rover was backed into a concrete wall to simulate a parking bump, in which the product compressed on impact and thus saving the bumped from impairment. Another great addition to your van, SUV or truck that we would like to recommend is the DNA MOTORING HITST-2-4O-111-BK-T2 hitch step. This item is constructed with the solid all-welded design for maximum safety and strength, offering protection to molded, vulnerable bumpers in the event of a collision. It’s worth considering as it is able to withstand road abuse and any heavy duty towing purposes to its definite capacities. While it may need a hitch pin when in use but you shouldn’t worry for the package already comes with a hitch pin as well as a bolt or clip-on installation/ 4-inch wide oval bar. 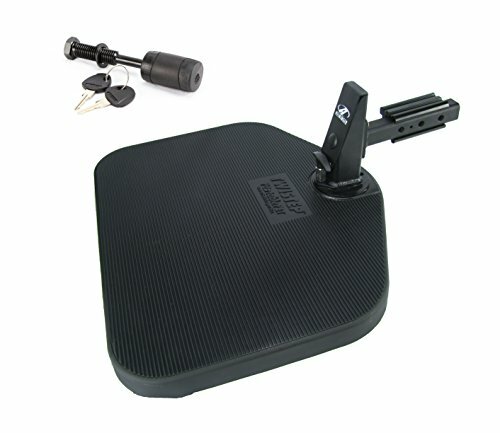 The item features a non-slip polyethylene step pad which fits any 2-inch receivers or curved edges. It’s capable to hold up to 350 lbs. weight capacity. The exterior is powder coated for guaranteed longevity. it’s only meant to be positioned on the rear of vehicles. They all the answer to their dilemma of living in areas where folks love to smash into each other’s truck or car bumper in the parking lot. The bumper is protected against any damage. All products made from rubber material are completely solid and are able to keep damage to vehicles at a minimum. They are as solid as military grade. To get you even more informed on the matter, below are some of the possible pros and cons that appear when having a hitch step. If you purchase a hitch step that also features an LED brake light then it can provide visibility for other drivers. In other words, it will increase safety measure. Most models can be installed and removed easily in three minutes or so. Users generally don’t need any tools for that so if you think it causes inconvenience and would like to remove it for some time, problems can be solved without any professional help! Some hitch steps are not able to be stored easily, meaning there are some models that can’t be disassembled and uninstall easily so when it’s not in use, it might cause inconvenience. Make sure you crosscheck the step fits the hitch mounts of your vehicle. The last thing you would want is getting this particular towing accessory that does not fit the receiver. Individual hitch steps fit different sized receivers. You should pay attention if they meet your needs. Do you want a hitch step that only allows access for dogs to get into and out of your vehicle or do you need one so that you can have access to your truck bed, the rear cargo area or roof racks? Determine beforehand whether you intend to mount it on the rear, on the side or in the front of your vehicle. Some models can be mounted anywhere on your vehicle but there are some that are only suitable or designed for rear-mounted hitch receivers only. Make sure you know if the step needs a hitch pin during installation or not. some products already include a free hitch pin in the package but some do not. While those that do include a hitch pin in the package may cost more if you are okay with investing a little bit of money then go for one that’s included with a hitch pin. That way, you don’t need to do a little errand to buy one. Make sure you know if you plan on keeping the step mounted on your vehicle for good or if you plan to remove it every time it is not in use. If you opt for the former then buy one that is made to be weather resistant and rust resistant. A hitch step might look so inconsequential that you would think it’s not worth spending your money on. 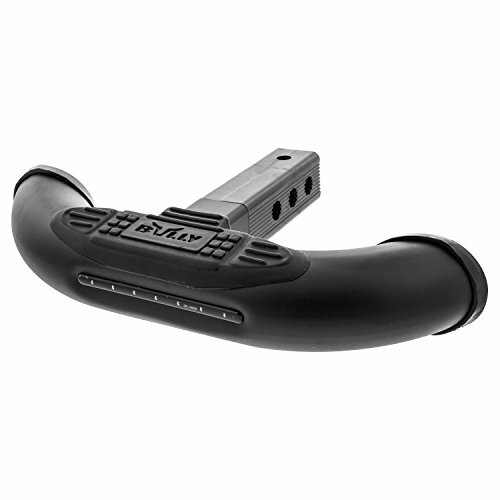 However, this accessory can improve your vehicle functionality in a great way. Especially when it’s snowing and the roof of your vehicle is covered in a pile of snow. If you are not tall then you will face lots of trouble removing it. Even a really long snow removal tool won’t even be able to cut it. That’s when a hitch step comes in handy. Did you know that in some states, driving while having snow on the roof of your vehicle is considered to be illegal? You could easily get pulled over for it. If you hate getting involved with authority then you should clean it off. However, removing the snow off the vehicle’s roof can be a tough job especially if you have a jacked-up Jeep or a big truck. By installing a trailer hitch step, reaching every part of the rooftop of your vehicle is a breeze. On the other hand, even if you don’t live in an area that does not snow, having a dominator hitch step will still do you a big favour. A universal hitch step is very useful with giving you a boost when cleaning all that grime and off-roading mud off your vehicle. Moreover, it would be especially convenient to carry cargo because loading and unloading are extremely easy with a step on the hitch. No matter where you want to go, hitch steps mostly offer convenience for everyone. And if you happen to purchase one that also has the ability to serve as a bumper guard then your vehicle will be protected from dent or damage especially if you live in small towns where people love to hit each other’s car’s bumpers. These products are all very worth buying. We hope that by the time you’ve done reading this review, you already have sufficient knowledge of this particular towing accessory in order to help you make an educated decision.